Asi pointed me in the direction of this new project from HSBC that he's been working on - it's a pertinent adjunct to the discussion about communication that delivers value in the last few posts. 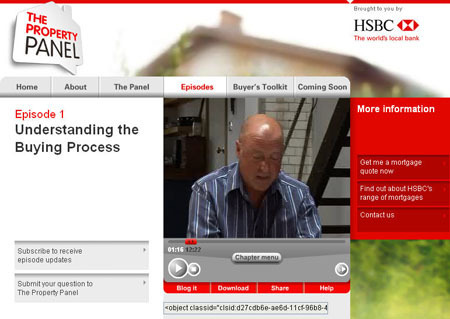 The Property Panel website is a resource to help first time house buyer navigate the process. There's a monthly webcast with a panel of experts, that users can submit questions to and then guide areas for discussion, and supporting information, tips and step by step guides. Having considered buying and genuinely been put off by what seems like a hideous amount of rigmarole [and the sheer time commitment required to find somewhere decent in London without unlimited funds], this seems to me to be an excellent way for HSBC to promote and demonstrate its expertise in mortgages whilst leveraging its resources to provide value and assistance to house hunters. It seems online is a natural space for win-win branded utility style communication - people rely on the web to provide information and, increasingly, services whilst advertising is actively avoided and blocked - so brands that can provide something earn the consumers attention. I've been talking about brands delivering value alongside messaging for a while now. If interruption advertising is spam, then delivering value alongside messaging is the only way to earn the right to talk to consumers. It seems that this is an idea that's taking root - the advertools piece below came out in the same week as Anomaly's branded utility piece in Adage. So I thought I would set out my model for this new way of communicating. This may seem trivial but it's not. Value is derived from relative scarcity and attention is increasingly scarce in today's media environment. There has always been an implicit value exchange occuring in advertiser supported content, from the soap opera of radio to the tv spots that pay for ITV, but increasingly the value exchange needs to be explicit as content is increasingly on demand and consumers can screen out the interruption advertising. Brands want to build relationships with consumers. Relationships are mutually re-inforcing, providing value to both parties, and dynamic, responding to the needs of each other over time via 2 way interaction. Smart brands have already started working like this in lots of different ways - the rise of experiential communications can be seen in this light. Advertools are one way to deliver zero sum communication. Crucially, the value delivered is now an opportunity to express your brand behaviour. Philips has been delivering value by actually stripping out advertising - getting rid of inserts in magazines and delivering paid for content from WSJ.com to consumer for free. As part of their "Sense and Simplicity" campaign they have created "a media plan based on a brand proposition" - delivering value and communicating their brand positioning. So, as I've said before, a good communication strategy should start with 2 questions: what are my communication objectives AND how can I deliver them in a way that delivers value?